Alicia M. Hess, FNP-C, is a board-certified Family Nurse Practitioner by the American Academy of Nurse Practitioners. She completed her Bachelor’s Degree in Nursing from the University of South Florida in Tampa in 2010, and completed a Master’s in Nursing program from Chamberlain University in 2018. 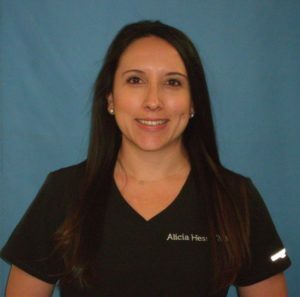 Alicia’s nursing background includes emergency nursing and cardiac services, and she most recently worked as a nurse practitioner specializing in ear, nose, and throat disorders. Outside of work, Alicia enjoys traveling, fitness, outdoor activities, and going to the beach. She also loves cats and attending Tampa Bay Lightning games and auto racing events.